The experiment is based on the entanglement property of quantum mechanics, also known as "spooky action at a distance"—a property so mysterious that not even Einstein could come to terms with it. The research could not be possible without access to the proper technology. One of the critical pieces of infrastructure that support quantum networking is accessible dark fibre. 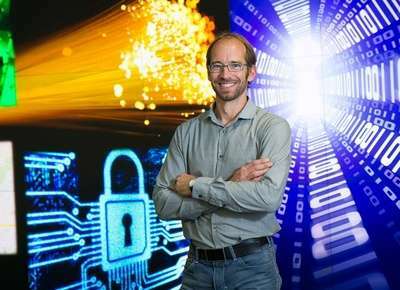 Dark fibre, so named because of its composition—a single optical cable with no electronics or network equipment on the alignment—doesn't interfere with quantum technology. Due to changes in the outdoor temperature, the transmission time of photons from their creation point to City Hall varied over the course of a day—the time it took the researchers to gather sufficient data to support their claim. This change meant that the two photons would not meet at City Hall. The Urban Alliance is a strategic research partnership between The City of Calgary and University of Calgary, created in 2007 to encourage and co-ordinate the seamless transfer of cutting-edge research between the university and The City of Calgary for the benefit of all our communities. The Urban Alliance is a prime example and vehicle for one of the three foundational commitments of the University of Calgary's Eyes High vision to fully integrate the university with the community. The City sees the Alliance as playing a key role in realizing its long-term priorities and the imagineCALGARY vision. First, that is the last thing any government would want their citizenry to have access too and second, never underestimate the ingenuity of hackers. There have been numerous announcements in the past claiming hackproof communications and been proven false. 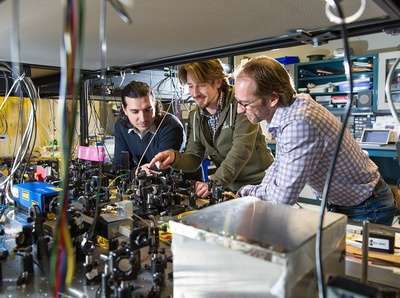 On the brighter side of things, at least science is beginning to find useful applications for quantum entanglement, rather than just observing it experimentally.